In my attempt to satisfy my sweet tooth this Holiday season, without indulging in the usual sugary and fattening treat, I was drawn to the idea of white chocolate. I’ve done a lot of reading lately on healthy fats and their ability to lower bad cholesterol, and decided that I needed more of these “good fats” in my diet. 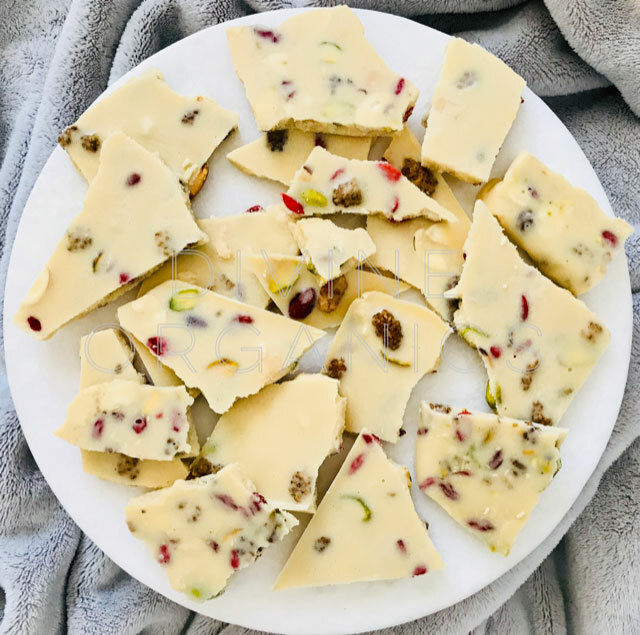 With wintertime being an ideal starting point, I came up with this recipe for organic white chocolate and decided to give it a try. 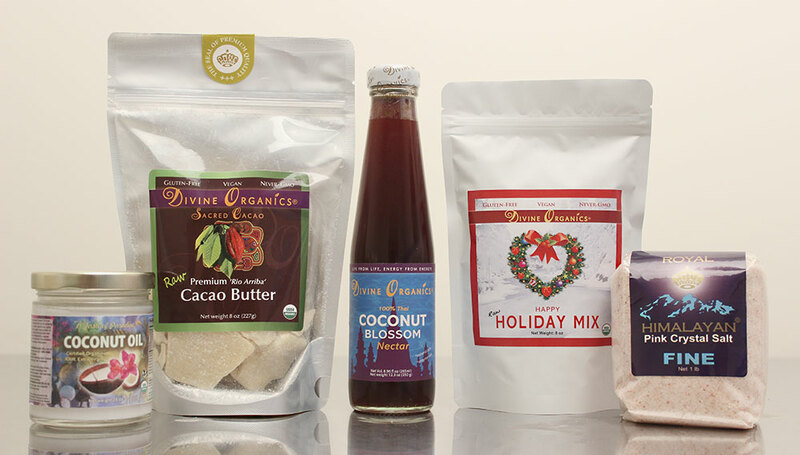 I added this year’s Organic Holiday mix in a special 8 oz. size, (included in a special recipe bundle), to give it an even greater nutritional boost. The richness of this bark can be tasted all around, with its addition of the premium ingredients Divine Organics offers. In a high speed blender, add remaining ingredients, and blend to form a smooth batter. Pour mixed ingredients from blender, over Holiday mix in baking pan. Freeze for a half an hour to set. Break up into chunks and serve. Keeps in an airtight container for up to one week. Want to make this recipe for an upcoming party or event? Right now we are offering a special when you bundle all of these ingredients, including an 8 oz. Organic Holiday mix, to create the recipe above. Our special Holiday pricing lasts through the whole month of December!